Another post from guest author, Cindy Faber. The majestic baobab tree is an icon of the African continent and lies at the heart of traditional African folklore. Baobab trees grow in some of the driest, remotest and poorest parts of rural Africa. There is no such thing as a baobab plantation; every tree is community or family owned and wild-harvested. They can live for up to 5,000 years and can grow to a huge 50 meters (approximately 164ft.) in circumference and the trunk can hold up to 4500 liters (approximately 1188 gallons) of fresh water, which is enough for 100 showers or 10,000 glasses of water. 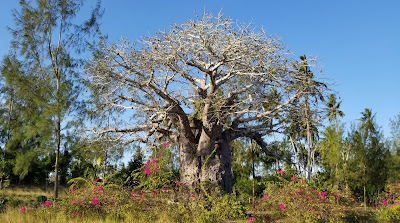 While many people know of the baobab tree, not many people know that it has a fruit. Baobab is the only fruit in the world that dries naturally on its branch. Instead of dropping and spoiling, it stays on the branch and bakes in the sun for 6 months - transforming its green velvety coating into a hard coconut-like shell.